As my cool cousin Charlie once said, laws are made to be broken, man. That’s certainly true in Norway, where someone already got arrested for driving a Segway while under the influence of alcohol a month after the country legalized the electric scooters. This is why you can’t have nice things, Norway. It was only last month that Norway lifted a ban on “self-balancing vehicles” because they can go as fast as mopeds, but officials had concerns about how safe they’d be on roadways with other vehicles. Alas, one man in Oslo has already been arrested for allegedly boozing and cruising, reports the BBC. 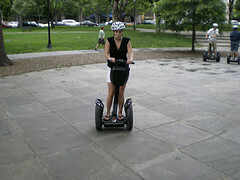 Witnesses in a restaurant area of town reported a guy exhibiting “strange behavior” while attempting to keep his balance on a Segway. Police arrested him and charged him with being drunk while driving a Segway. This initial incident already has traffic cops worried. Mom and Dad are already sighing and shaking their heads at you, kids. “I’m not surprised, but disappointed they don’t appreciate the danger,” a police inspector said. Just disappointed in you. That’s all. Disappointed.